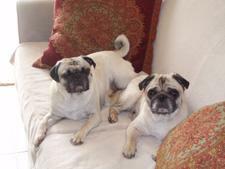 Hi, I’m Pugsy and the little guy in the picture is my new brother Seymour. My Momma got me (Pugsy) from CPR just over 2 years ago and gave me new home with lots of love and kisses. I love kisses. Then in June my Momma bought me a new house with a nice big yard so I can run around and play, but one day Momma went back to CPR and she brought home my new brother Seymour. At first I didn’t like it, Seymour was kissing my Momma! But then she explained what a tough time Seymour had had before he came to live with us, and that he needed lots of love and kisses, so I guess it’s OK. I remember when I didn’t get any kisses and that made me sad. Now me and Seymour play games with Momma, and she lets us both sleep on the big bed, we love to snuggle up with her. Don’t tell Momma, but I like having Seymour around, he’s a fun little guy. Oh yeah I nearly forgot, we have an older brother, Pharo, but he doesn’t look like us, I think he’s called a “cat”! He’s OK though, when Momma goes out he opens the Pantry door for me and then we “borrow” all the treats she keeps in there, but Shhhhhh Momma doesn’t know!